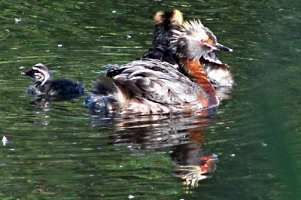 A Strange Tripper sends us this photo of a family of grebes she discovered somewhere in the wilds near Beaverlodge, Alberta. Those little ones are so cute, I sure hope they don't catch the bird flu. Another Strange Tripper from the Great White North passes along this: "Go to Google, type in 'failure', then click on the 'I'm Feeling Lucky' button."